There was one night I was making Shrimp and Sausage Skillet, and just wanted something “carby” to go along with it. I generally have to have some carbs at each meal, otherwise I end up having major blood sugar issues between meals! I remembered seeing a post somewhere about ranch mashed potatoes… so I thought hey, let’s whip some of those up. Disclaimer: This is one of those recipes that I just kind of threw stuff in and kept tasting it until I liked it, so if you’re looking for exact measurements, this recipe might drive you a little cray cray. 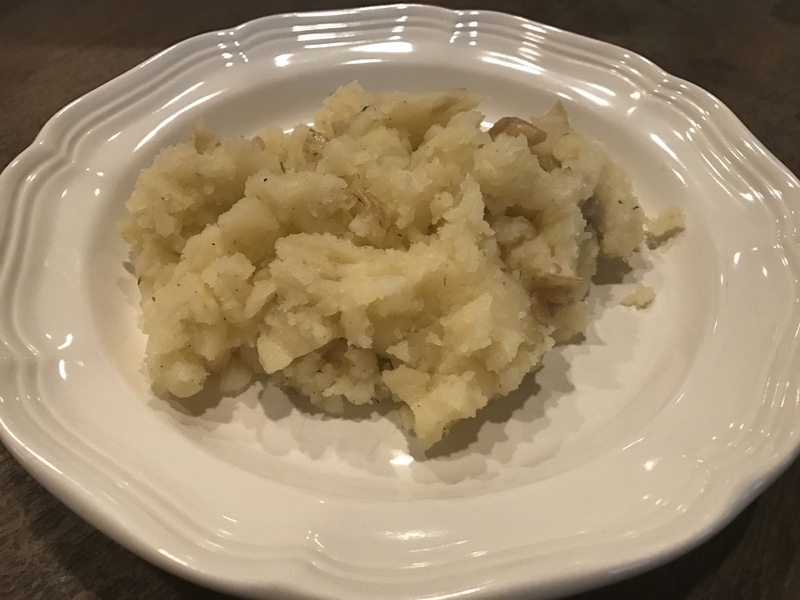 Cook your potatoes through, I just heated mine up in the microwave for a few minutes after poking fork holes in them,but you could boil them, bake them in the oven or crock pot if you would rather. Once the potatoes were decently mashed, I added the ghee to the hot potatoes so it would melt. If your potatoes sat out and cooled, you might want to melt the ghee and then pour it in or reheat everything first. You may want to add more ghee depending on how moist you like your mashed potatoes. Add the creamy ranch, sea salt and pepper to taste. Just pour a little, stir and mash, taste and then add some more if you want. So just another quick and easy side for you in case your meal needs a little something extra. I’m kind of cracking up at how boring this picture below looks but this little dish was actually quite tasty. Hope you enjoy!